If perhaps you are unaware, Black/African people (of whom I am among) are in a 21st-century struggle of intellectual and institutional warfare that is being waged on mental and ideological battlegrounds of what I define as The Sovereign Psyche, which I deem to be the most prized commodity of this century. What is The Sovereign Psyche and why is it so highly valued? Well to begin, in 1943 British Prime Minister, Winston Churchill, delivered a coded but telling wartime speech as Germany was expanding its territorial conquests during World War II. Although the British and other European nations were imperialists themselves who had colonized countries worldwide in grotesque forms, the Allied Powers determined that a line had to be drawn since Germany was similarly inflicting upon fellow Europeans what they had been doing all along throughout Africa. Hence, Churchill proclaimed that “The empires of the future are the Empires of the Mind.” In other words, instead of butchering Africans and others through colonial subjugation, Europeans would dominate the world via superior sovereign intellect backed by superior sovereign systems and sovereign institutions. As this work demonstrates, the outcomes of this warfare have produced varying degrees of “chattel freedom” for Black/African people worldwide. A central premise of this work therefore is that, “there is no such thing as intellectual or institutional equality between Black and White America.” A primary cause and contributor to all racial disproportions and injustices is that Black America lacks the equivalent strength of institutions and appropriate end-use of our intellect, of which the solution as I argue, hinges upon applications of The Sovereign Psyche. The “psyche” in general is a part of the mind where thoughts are calibrated into a “motive force” that causes people to correspondingly act. In short, The Sovereign Psyche comprises the intellect and willpower that materializes what I define as the “3 Dimensions of Sovereignty,” which are: Self-Authentic Freedom, Government, and Development. In order for systems and institutions to function with the highest efficiency, these 3 Dimensions must operate in singular and synchronized fashion, since failures or disruptions in one will render shortfalls in the others. Thus, the degree of development of people/nations is largely proportional to the level of sovereign intellect and sovereign willpower that impels them to act to advance their interests and solve their problems. Among its multiple meanings that include self-government (which is the highest expression of sovereignty), sovereignty is an intangible substance that becomes visible through products and symbols which people must self-create. In this sense, sovereignty foremost is an energizing MINDSET, CONSCIOUSNESS, and THOUGHT PROCESS by which people define and express freedom through the unique particularities of their political and ideological self-identities. So aside from establishing a nation or state, sovereign principles can be applied by individuals, families, groups, and communities who cooperate as cohesive units, with the understanding and aim of making their self-interests primary. This is a central message of this work because a key to redressing the manmade inequities of Black/African people, lies in activating the sovereign consciousness in our minds in order to implement sovereign practices in our daily lives. In this sense, sovereignty relates to realizing our inalienable rights of “life, liberty, and the pursuit of happiness” as African people in America. “Chattel Freedom” as I apply this term, entails being tied to systems and institutions that not only fail to amply protect and advance our interests, but the interests of others are advanced at our expense. To combat chattel freedom, this work promotes “self-authentic freedom,” or freedom that is genuine; freedom that is not copied or superimposed; freedom that is not formulated with hypocrisy or administered by proxy. Self-authentic freedom is a derivative of The Sovereign Psyche which ensures that the ideals, institutions, and systems which govern a people are designed to promote and protect their self-interests. Based on conventional political thought, the concept and consciousness of sovereignty should be rejected outright by Africans in America. After all, freedom has presumably already been prepackaged for us through Jeffersonian Democracy which is self-acclaimed by Euro-Americans to be more judicious and moralistic than any other political system in the world. However, this work performs sovereign analyses and interpretations of history which uncover the unprincipled nature and practices of Jeffersonian Democracy as being the core and cause of racism, past and present. By being “unprincipled” I am asserting that Jeffersonian Democracy is deliberately designed and practiced in ways that are insufficient to redress the most crucial of Black needs and issues. This book is fast moving and concise, meaning that topics are not prolonged and critiques are not exhaustive. Subjects and realizations are rather broached to introduce ideals and redefine concepts that should be explored and applied. 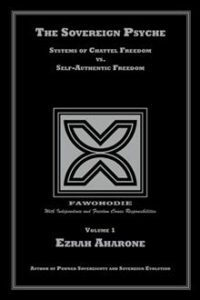 In this sense the contents serve as a handbook of sovereign principles, standards, and doctrines that are intended to expand the discourse and boundaries of what 21st-century freedom for Black/African people should entail. Finally, regardless of your political or ideological leanings, the world today rotates upon various axes of sovereign power. And although this work specifically relates to Black/African people, the sovereign functions, frameworks, and principles that I identify are universal. People worldwide apply the same sovereign criteria that I outline herein to define, design, and implement what they deem to be self-authentic freedom, government, and development. In this context, the concepts of this work are far more rational than radical, being that The Sovereign Psyche will undoubtedly continue to be the driving force of freedom and the most valued commodity of the 21st-century. From emancipation to segregation to integration – from Tubman to King to Obama – today’s freedom of African Americans emerged from a continuum of political and psychological evolutions, each of which is built upon prior legacies and achievements. In advancing the forward flow of this progression, SOVEREIGN EVOLUTION re-declares freedom and equality in 21st-century terms, by using sovereign principles and standards to self-interpret our historical development and self-determine our future direction as a people. With “sovereignty” being the highest expression of political authority and accountability of a people, Ezrah applies sovereign ideals in ways that no other work has convincingly or relevantly related to the African American experience. SOVEREIGN EVOLUTION however does not promote a political movement for Black independence, but rather provides an expanded political consciousness that’s necessary to fortify Black ideals, interests, and institutions upon Obama’s inevitable completion of office. As Ezrah writes, “SOVEREIGN EVOLUTION is both the title of the book, as well as a transformative concept that offers new realms of approaches and solutions to centuries-old difficulties.” Each chapter accordingly sets a platform to infuse sovereign awareness and discourse into mainstream domains that span from elders and Hip Hop culture; to Black universities; to church congregations; to Black organizations and government officials. 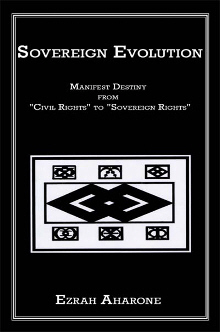 Sovereign Evolution offers African Americans a 21st-century approach to freedom and equality by using sovereign principles to analyze and evolutionize our current Political and Ideological Self-Identity. Though its content centers on African Americans, it has wider political implications that equally relate to Africans in general. Since the dawn of humanity, people have engaged what I call “The Human Quest for Sovereign Powers.” Though I establish a foundation of legitimacy for African Americans to join this quest, the book does not instruct a movement for political independence. It rather shapes the sociopolitical substance of our historical experience into a sovereign consciousness. It encapsulates the issues and political language necessary for sovereign and intergenerational dialogue, and applies sovereign ideals in ways that no other work has convincingly or relevantly related to the African American experience. This work does not regard “Civil Rights” as the standard or goal by which our freedom should be measured or aspired. I rather circumscribe “Sovereign Rights” in a universal and historical context that confers us with just as much integrity and authority as any other people to espouse and employ sovereign standards for ourselves. Having civil rights is “par for the course” of human dignity and decency between every government and society. A government deserves no more “credit” for treating its citizens civilly, than a man deserves “credit” for not beating his wife. The granting of civil rights and voting rights should not be viewed as a marker of a government’s legitimation, since a genuinely moral government would never make its citizenry “fight for civil rights” in the first place. It is an indefensible affront for any government to have a people engaged in a protracted struggle for hundreds of years to be treated civilly. If after centuries, a people still find themselves fighting to protect their civil rights, then they are in a wrong and unprincipled political relationship. Facts herein show that Africa comprised sovereign kingdoms long before Africans were enslaved in the Americas. I therefore extend the political ramifications of slavery into an unresolved current issue by showing that slavery not only deprived us of freedom in the past – but its reverberations have disinherited us of sovereignty at present. Our need for a Sovereign Evolution is not diminished by the 4 or 8 years of Barack Obama’s presidency, given that America is approaching 2½ centuries. Foremost, it is a mistake to credit his presidency to “opportunities of equality” as the establishment promotes for its own self-aggrandized benefit. Conversely, it is due to America’s “political limitations” that, out of nearly 40 million Black people, only one of us has reached Obama’s stature after nearly 400 years. Whether the issue concerns Katrina and Jena, or being underrepresented in Congress and overrepresented in penitentiaries, the common thread as I demonstrate is that, African Americans are an Un-Sovereign People, who pay varying degrees of Un-Sovereign Consequences. Thus, in a very methodical manner, I circumscribe sovereignty in a universal and historical context that confers African Americans with just as much integrity and authority as any other people to espouse and employ sovereign aspirations. The ideological framework herein self-applies and legitimizes the concept of sovereignty in ways that no other work has succinctly captured in politically-relatable terms, specific for African Americans. Realizing that not all African Americans will embrace sovereign values, I uniquely specify how a Sovereign Evolution can mutually advance the best interests of us all, without conflict or compromise to core beliefs of anyone. Accordingly, the book sets a platform to infuse sovereign discourse into mainstream domains that reach from street corners of “the hoods,” to Black universities, to church congregations, to the halls of Congress. The themes revolve around Black America being a “free,” but not a “sovereign” people. 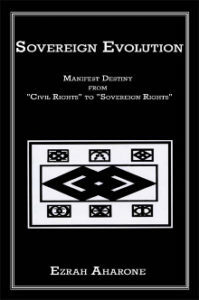 Since sovereignty (not civil rights) is the pinnacle of all freedoms, the book imparts evolutionary outlooks based on “sovereign-minded” frames of reference. This approach leads to new insights and actions that better serve Black/African interests. A central premise of the book concerns “Concepts of Freedom.” Whereas Black America’s fight for freedom has been limited to “Civil Rights, Integration, and Citizenship,” on the other hand, Whites fought for nothing less than “Sovereignty, Independence, and Statehood.” This distinction causes Blacks to accept sociopolitical sub-conditions which history proves White America would never tolerate if roles were reversed. Pawned Sovereignty therefore challenges the core of America’s body politics and mainstream norms of Africans in America. Its political positions and philosophical conclusions will enhance or make you rethink your worldviews. Most of all, it’s solution-oriented. Since many Black-related problems lie beyond conventional democratic remedies, Pawned Sovereignty identifies latent sources of Black strength and blueprints how to leverage them into bona fide vehicles of sociopolitical progress and power. This book comes at an uneasy time in history when the world is plagued with problems related to poverty, disease, racism, ideology, terrorism and war. The inflamed nature of these issues leads to the inevitable conclusion that conditions will worsen before improving. Rather than respecting the array of humanity’s cultural, religious, and ethnic differences, some people and governments are more motivated by skewed forms of nationalism that superimpose particular “ways of life” on others. In today’s world, might often makes right. The one word that best links all the subjects of this book is “thoughts.” Like every other nation, America is the result of thoughts. Its customs, traditions, laws and constitution are all products of thought. Americanization can be summed up as constellations of thoughts that people have learned to accept and apply as a “way of life.” As valuable and benevolent as this “way of life” may seem to Americans, some people in other countries will always embrace “thoughts” and “ways” of their own. The central message that runs through all the subjects is that Black America lives in a “world of thoughts” and has adopted a “way of life” that do not incorporate enough input of our own “thoughts” and “ways.” By the 1960’s when the establishment thought it was finally time to concede to integration, the political and ideological design of America was already well thought out. Hence, we did not participate in casting the actual mold of Americanization. And since our specific political and economic interests as a sub-culture did not always fit, we were forced in many instances to painfully adjust to the prefabricated contour and contents of the mold. 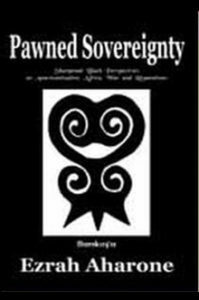 The title, “Pawned Sovereignty,” is not to suggest that Black America should launch a sovereignty movement of self-government, but rather to contrast our life without sovereignty and to draw attention to the resulting quandaries thereof. What I call “Sharpened Black Perspectives” in the subtitle, are based on interpretations of history and a discernment of the world from viewpoints aimed exclusively to advance and safeguard Black interests. Black America has a history and experience unlike any other people on earth. To use the word “resilient” to describe our nearly 400-year sojourn in America understates reality. Even though we have more-than paid our dues to society in full, we still face uncalled-for domestic hurdles. Instead of continually trying to reform away the effects of these hurdles, the wise thing is to understand what lies at the core of our age-old struggle for equality. One of the best ways to do this, as Pawned Sovereignty does, is by conducting two distinct levels of objective scrutiny. The first involves scrutinizing the history of Americanization as it evolved into what is now regarded as an “ideal.” The second level scrutinizes the circumstances under which we as Africans resigned ourselves to accept and pursue Americanization as a “goal.” The sequences of these particulars offer telling insight about America’s character as a nation, and unveil political and psychological influences beneath the surface of democracy, that pose inevitable limitations to true equality for Blacks in America. If you were to regard Americanization as an ongoing journey to a specified endpoint, this book would be a rest stop and refueling station for you to pause, take a look around, and survey the political/economic terrain, as well as the surrounding obstacles. From this vantage, you will be better positioned to see where Black America came from, and then properly gauge our present status to determine if we are traveling in the right direction, at the right speed. Maybe we should have arrived at our destination already; maybe we need to veer at the next fork; or maybe the vehicle needs repair. And just as importantly, we need to assess if the company of people we keep are helping, or hindering, our progress. You will find that the contents of Pawned Sovereignty unfold an updated roadmap of “new thoughts” to help navigate this journey. The positions and conclusions, however, should not be viewed within the context of a racial standoff with White America. Racism is an outward shadow of spiritual immaturities within man that cannot be legislated away in bills or constitutional amendments. Its only cure is for people to search the depths of themselves, with the desire to root out pollutants lurking within. Racial themes are however unavoidable, since racism is intrinsic to America’s political and economic construct. But another unique factor that differentiates Pawned Sovereignty from other works is that it surgically dissects and challenges the components of this construct, as opposed to trying to harness the elusive shadow of racism.